Musical transcription has a long and auspicious history, and Michele Mangani’s arrangements follow a tradition of recreating popular operatic tunes for small groups of oboes, clarinets, flutes and horns, supplemented on this recording by double bass. These works span some 77 years of Italian opera, from Rossini’s L’Italiana in Algeri to Puccini’s Tosca, taking in the verismo of Mascagni’s Cavalleria rusticana and the bel canto tragedy of Donizetti’s Lucia di Lammermoor on the way. 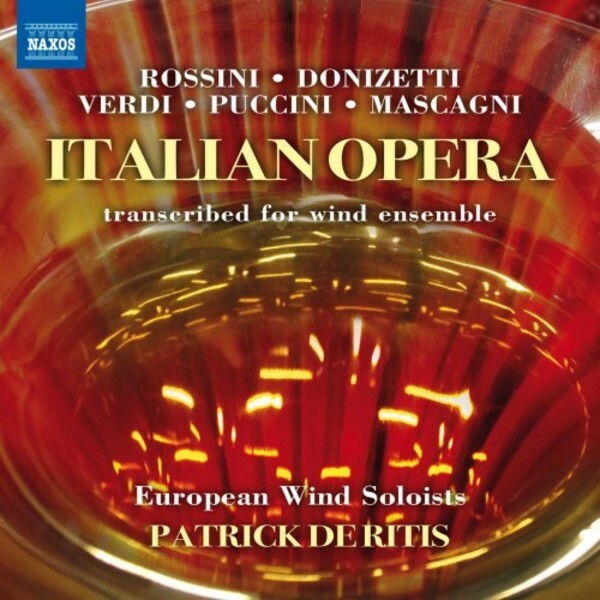 This superb release offers an opportunity to revel in some of the greatest Italian operatic music performed by a crack team of wind soloists from major European orchestras, including the Vienna Philharmonic, Vienna Symphony, and the Orchestra Filarmonica della Scala di Milano. Award-winning composer and wind-band specialist Michele Mangani’s transcriptions for this setting also build on examples from the 19th century, the golden period for this kind of arrangement. Such a recipe of massively popular music in rich new sonorities and virtuoso performances can only result in “andare a ruba”, or sales like Italian hot cakes!